Combine the other 1/2 cup water, white sugar, corn syrup and salt in a small pan, and cook, covered over medium high heat for 3-4 minutes. Remove the lid and clip a candy thermometer onto the side of the pan and continue cooking until the mixture reaches 240 degrees F, approximately. Once the mixture reaches this temperature, take it off the heat. With the mixer running on low speed, slowly pour the sugar syrup mixture down the side of the bowl into the gelatin mixture. Then increase the speed to high. Continue to whip until the mixture becomes very thick and is lukewarm, about 12 to 15 minutes. Add the vanilla during the last minute of whipping. Lightly spray a 9 by 9-inch baking pan with nonstick cooking spray. Add 1/4 cup the icing sugar and cornstarch mixture and move around to completely coat the bottom and sides of the pan. Return the remaining mixture to the bowl for later use. When ready, pour half the mixture into the prepared pan, using a lightly oiled spatula for spreading evenly into the pan. Dust the top with enough of the remaining sugar and cornstarch mixture to lightly cover. 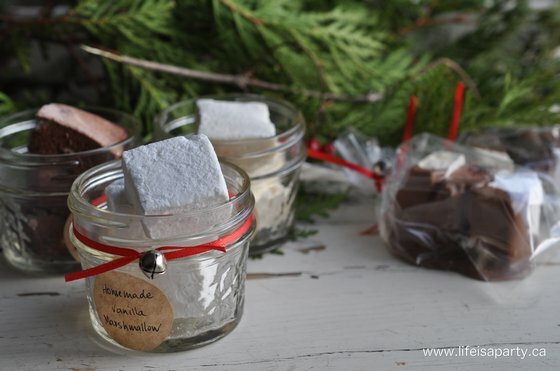 Prepare a 9 x 5 inch loaf pan, and prepare in the same way as you did for the Vanilla Marshmallows, using 1/4 cup of icing sugar, and cornstarch mixture. 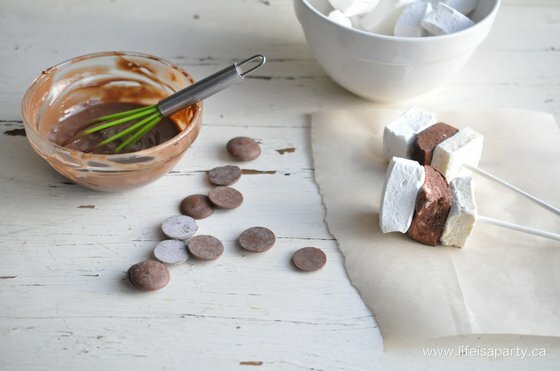 To make the Bailey's Marshmallows, remove 1/4 of the marshmallow mixture (or half of what remains in the mixture after removing half to make the Vanilla Marshmallows) and place in a mixing bowl. Add 1/3 cup of Bailey's and stir to combine completely. Pour the mixture into the prepared pan, smooth, and coat with the remaining icing sugar and cornstarch mixture. Spray a 9 x 5 loaf pan with cooking spray. Mix 1/8 cup of the icing sugar and cornstarch with 2 tbsp of cocoa. Use this mixture to coat the pan, and reserve the rest for later. Mix the other 3 tbsp of cocoa with 3 tbsp of water to form a liquid, and use the mixer to combine it with the remaining 1/4 of the marshmallow mixture. When it's combined, pour into the prepared pan, and smooth. Coat with the remaining icing sugar, cornstarch and cocoa mixture. 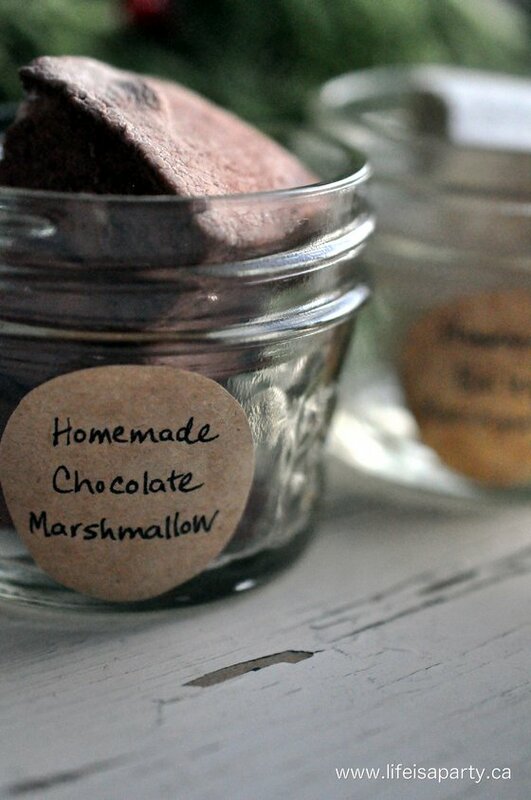 This recipe is adapted from Alton Brown's Marshmallow Recipe. 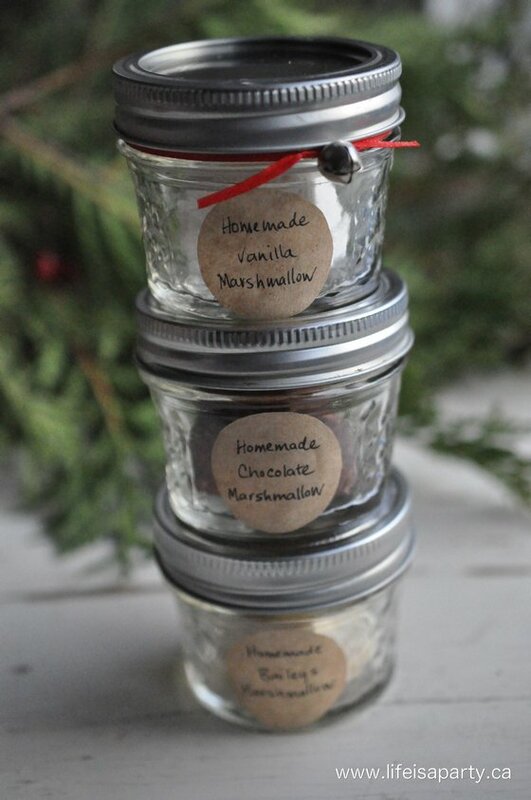 I packaged some up in some sweet mason jars for gift giving -perfect way to really impress your peeps this Christmas. And, just to guild the lily…dipped some in chocolate. 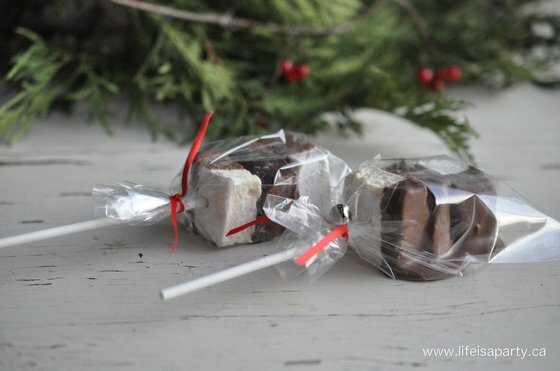 I just stacked up all three kinds on a lollipop stick and dipped them in melted chocolate. 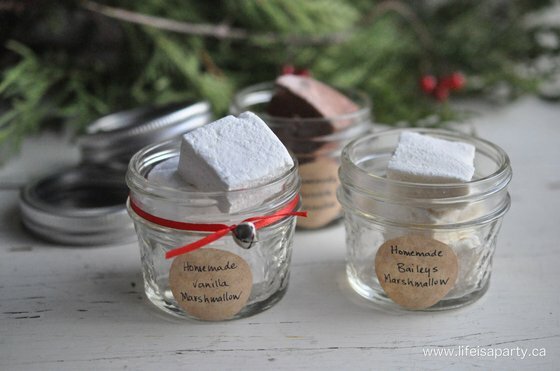 With homemade flavoured marshmallows, life really is a party! This post is linked up at The Party Brunch, Inspire Me Please Link Party, Christmas Wonderful Link Party, and Tatertot’s and Jello’s Link Party Palaooza. So excited to try these and what a perfect gift idea! Love, Love anything Bailey’s! Thanks for sharing! I LOVE these marshmallows. Just thousands times better than the bagged version. I was looking for a chocolate version. It looks like you did 50% vanilla, 25% Baileys and 25% chocolate? So if I want to do half vanilla and half chocolate, I would just double the chocolate ingredients, correct? Or, if I have enough gelatin, maybe I’ll make one batch of each. LOL Yum! Hi Mary, That’s right I did, 50%, 25% and 25% so I would double the chocolate for 50%. Enjoy! 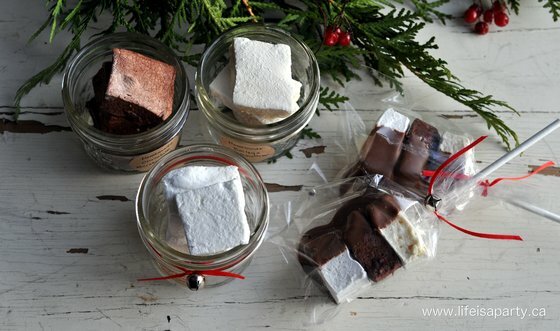 I was planning on making these marshmallows with an old family recipe for Baileys (involving heavy cream and sweetened condensed milk). Do you know if it will still work, or does it rely on the preservatives from the store-bought Baileys to hold consistency? Also, since I will be mailing these as gifts, I was brainstorming on how to keep them: best idea so far being to vacuum seal and freeze. Will this ruin them? Your homemade Baileys should be totally fine, just stick to the required amount. 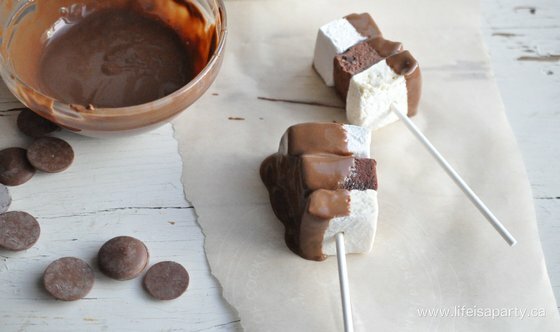 The liquid does make the marshmallows a little less fluffy, but would be the same for any liquid that’s added. I wouldn’t freeze them, since I’ve never frozen marshmallows. I have read on-line though that they do freeze well. But, I won’t freeze them to mail them anyway since they won’t stay frozen in the mail anyway…unless you have some special container/shipping? They should be fine if they’re just in a sealed container. Best of luck! Yes Powdered sugar and icing sugar are the same thing.